Last holding the top spot in 2010, Google has dethroned Apple to once again become the world’s most valuable global brand in the annual BrandZ™ Top 100 Most Valuable Global Brand ranking. Share of Life: Successful brands such as Google (No 1 brand), Facebook, Twitter, Tencent and LinkedIn are more than just tools, they have become part of our lives. They offer new forms of communication that absorb people’s attention and imagination, while also helping them organize the rest of their lives at the same time. To gain more of our mind-space, brands such as Tencent and Google are even crossing categories. This trend also pushed No 1 Apparel brand Nike, a prime example of a brand seeking to become a share of life brand which offers services such as Nike+ that extend well beyond its functional raison d’etre. Technology service companies continue to climb: Not only are the top four brands technology companies, but so too are many of this year’s biggest risers. This year’s fastest climber was leading Chinese internet brand Tencent, up 97% to $54 billion and the No 14 position, followed by Facebook which rose 68% to $36 billion and took the No 21 spot. New brands in the Top 100 include Twitter at No 71 with a brand value of $14 billion and LinkedIn at No 78 worth $12 billion. 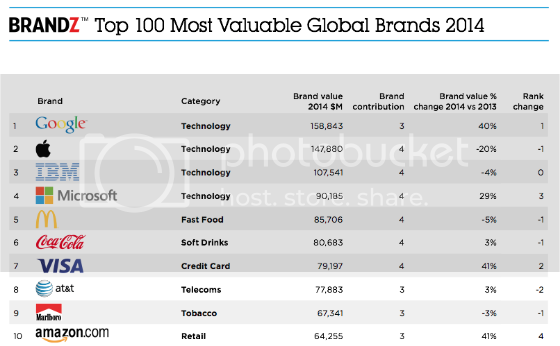 Collectively, Technology companies make up 29% of the value of the BrandZ Top 100 ranking. High value brands provide faster growth: An analysis of the BrandZ™ rankings as a “stock portfolio” over the last nine years shows a highly favorable performance compared to a wider stock market index, the S&P500. While the value of the companies in the S&P500 index grew by 44.7%, the BrandZ™ portfolio grew by 81.1%, proving that companies with strong brands are able to deliver better value to their shareholders. A graphic is available here.